KIEV, Ukraine -- Ukrainian Prime Minister Mykola Azarov ordered a dozen local reporters to be barred from covering government meetings after they staged a protest on Wednesday over attacks on journalists at a rally. Journalists show off signs, pinned to their backs, as they stage a silent protest during a cabinet meeting in Kiev, May 22, 2013. When reporters at the cabinet meeting stepped in front of television cameras and turned their backs, emblazoned with slogans, on Azarov and his colleagues, the prime minister reacted sharply. "What kind of show is this?" he said. 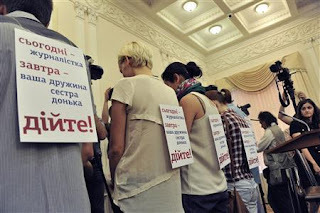 The reporters, members of a journalists' pool allowed to attend weekly cabinet meetings, bore signs pinned to their backs reading: "Today it's a female journalist (beaten up), tomorrow - your wife, sister, daughter. Do something!" Azarov said they should be expelled from the journalists' pool. "Write down their names and revoke their accreditation," he instructed his aides. "We respect journalists' work but please do not turn government meetings into a circus." The two journalists who say they were attacked were covering clashes between supporters and opponents of President Viktor Yanukovich during rallies in Kiev on Saturday. They say they were beaten by Yanukovich's supporters while police simply stood by. Police are investigating the allegations but opposition politicians have questioned their willingness to do it thoroughly. Condemning the attacks, the U.S. embassy in Ukraine said on Wednesday: "Such violent acts have no place where people are exercising their rights to peaceful assembly." "We call on the Ukrainian authorities to conduct a thorough investigation and urge them to take appropriate action to bring the perpetrators to justice. We also urge the authorities to investigate the apparent inaction by the police during the incident." Protests by reporters have become frequent under Yanukovich, who came to power in 2010 and quickly consolidated power by installing his allies in key positions and reversing constitutional changes that had strengthened parliament. Last March several reporters wore paper masks of Yanukovich when they attended his news conference. And last year a dozen journalists stood up and raised anti-censorship banners when Yanukovich hailed Ukraine's march to media freedom at the World Newspaper Congress in Kiev. Some journalists say the government is cracking down on media freedom and the media, most of them controlled by influential businessmen, are censoring themselves so that their owners maintain good standing with the authorities. Azarov's spokesman Vitaly Lukyanenko said the government's press department would review Wednesday's incident and decide whether to strip the reporters of accreditation. "How is the prime minister to blame (for the beating of reporters)? Why was he subjected to this slap in the face?" he said.